FB Purity v13.2.3 has been released! 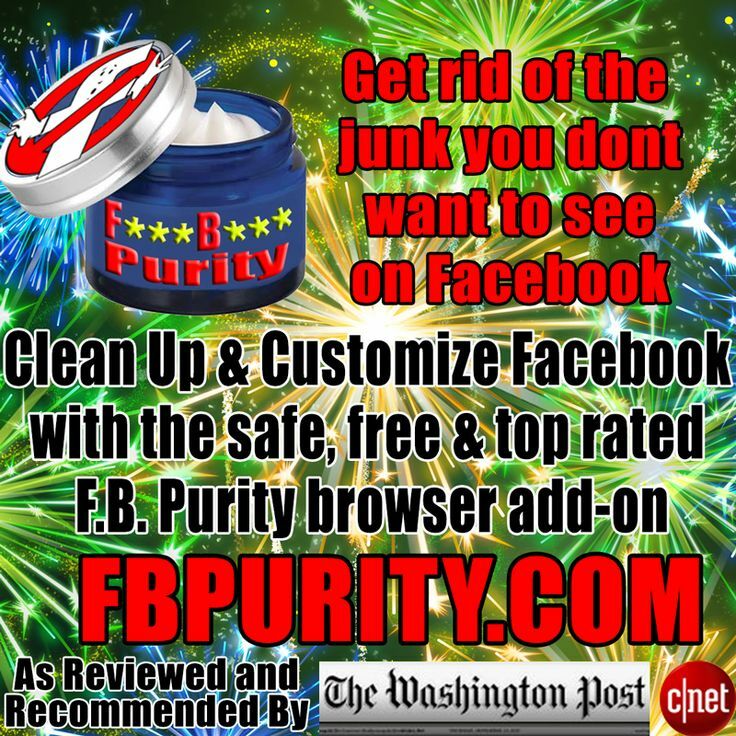 Clean up and Customize Facebook with the safe, free and top rated FB Purity browser add-on. Fixed: FB Puritys newsfeed filters had stopped working correctly, allowing stories that you wanted filtered out through, this is now sorted. Removed: Removed the “E” keyboard shortcut for toggling the “Expand newsfeed” option, as it was causing problems for people who were triggering it accidentally. You can however still use the Clickable “⇔” button at the end of the FBP info bar (where it says how many stories were hidden) to toggle that option, or set it via the FBP options screen itself. If you have any questions or problems with FB Purity, please read and follow the advice on the FB Purity FAQ (Frequently Asked Questions) page, thanks. FB Purity is a safe, free and top rated web browser extension for Google Chrome, Firefox, Safari, Opera and Maxthon. It lets you clean up the junk and customise Facebook the way you want it to be. It has many cool features and has been reviewed and highly recommended in none other than the Washington Post! FB Purity v14.0.0 Fixes feed filtering for Firefox & the FF add-on is now signed! This entry was posted in Facebook, FB Purity and tagged block facebook ads, clean up facebook, customise facebook, Customize Facebook, Facebook, facebook ad blocker, facebook filter, facebook purity, FB, FB Purity, fix facebook annoyances, fluff busting purity, hide ads, hide facebook ads, hide games, hide sponsored posts, hide sponsored stories, newsfeed filter, newsfeed filtering, remove facebook ads, solve facebook problems. Bookmark the permalink. When I see that one of my family has posted a video, I open it and play it OK, but when I click on fullscreen, the video disappears but the audio part of it continues. How can I get a full-screen video to display? Also, my Messaging function does not display. How can I get it to display and to allow me to message friends? FBP seems to be affecting my gmail too. I am visually impaired and cannot read the blue and black text on a white background. I can read white text on a black background. Can I change an FBP setting to allow white text on a black background? Check the FBP user guide page for information on how to change facebook’s colours.